In Aztec religion, Xiuhcoatl was a mythological serpent, it was regarded as the spirit form of Xiuhtecuhtli, the Aztec fire deity, and was also an atlatl wielded by Huitzilopochtli. Xiuhcoatl is a Classical Nahuatl word that literally translates as “turquoise serpent”; it also carries the symbolic and descriptive meaning, “fire serpent”. It was a lightning-like weapon borne by Huitzilopochtli. 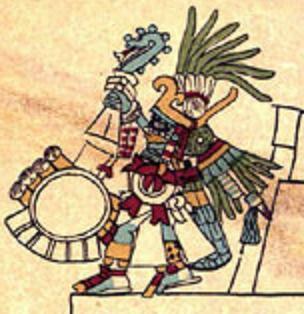 Huitzilopochtli was a tribal god and a legendary wizard of the Aztecs. Both Luke Skywalker and Obi Wan Kenobi’s light sabres are turquoise. Is this another hat-tip to antiquity from George Lucas?